Inspirational artwork showing Caesar Chavez and the Rev. Dr. Martin Luther King, Jr. on a faux brick wall background. 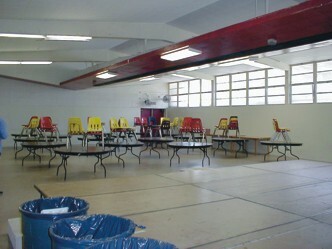 Before: Open trash cans in a room with only a few round tables and chairs. 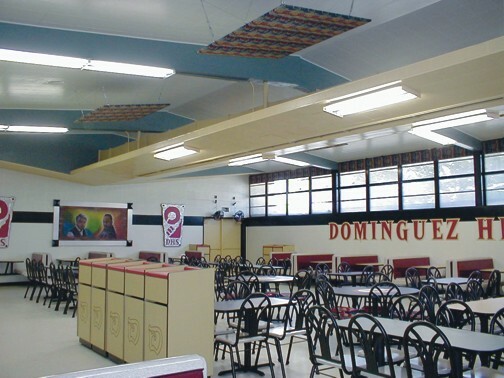 The walls had not been repainted in years and there were few students eating in the room. Also — how sanitary is it to stack the chairs on top of a clean tabletop? After: Furniture in school colors with inspirational artwork on the walls. The students chose furniture with school colors, enclosed trash units and inspirational artwork placed on colorful walls.